Dimapur police cracked the triple murder case at KS Wotsami Complex here on June 4 and arrested two persons in this connection on Tuesday. In a joint operation, Dimapur police with the help of Manja police under Karbi Anglong district of Assam arrested the two accused from their villages under Diphu police station on Tuesday for allegedly killing the three hotel employees staying at the complex here. They were brought to Dimapur on Tuesday night. Three youths identified as Tateutui Newme from Nchan village in Peren district, Tia Sangtam from Tethuze village in Kiphire district and Hori Teron from Gaitor village in Karbi Anglong district who were employed at a hotel here were found murdered inside a room at KS Wotsami Complex. 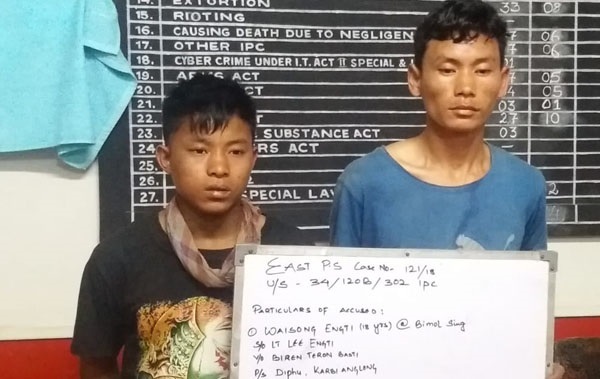 The two arrested have been identified as Arun Rongpi (19), son of Monsing Rongpi, from Shikari Timong village and Waisong Engti (18), son of Lee Engti, from Beron Terong village, both under Diphu police station. Dimapur additional DCP Yanrenthung Lotha said Arun was first arrested at around 1.30 pm from Shikari Timong village while Waisong was arrested four hours later from 5th Mile at Beron Terong village. Stating that the investigation had to be started from scratch as there were no particulars of the suspects, Lotha said the police were able to crack the case with the help of CCTV footage on June 9 and after identifying the suspects from the local people of Karbi Anglong district. The DCP also said the police team had to walk through jungles to reach the villages of the two accused as they did not use mobile phones. After committing the murder on the night of June 4, the accused escaped through the bathroom window of the room where the three victims were staying and boarded a train in Dimapur railway station at around 5 am. They reached Diphu around 7 am before leaving for their respective villages. The DCP said the police were yet to ascertain the motive behind the killing as investigation was still on. However, it was reported earlier that the killings happened over a missing mobile phone. Personal enmity with the three deceased victims was also initially assumed as a probable motive. The Dimapur police expressed gratitude to Karbi Anglong police for their help in nabbing the two accused within nine days of committing the crime.